Well the theme for todays #waso is relax. Which is a good thing to tell me at moment as I try to get everything done in 4-6 weeks less time than I thought I had. 3 weeks today (13/9) by this time (7pm) I will have finished work for at least 41 weeks…. Relaxation at moment for me is usually playing computer games (MMOs mainly with our friend P) – nothing better than hitting stuff after a bad day at work 😀 I started playing MMOs about 7 years back with Lord of the Rings Online (big Tolkien fan) and have played a number both seriously (raiding regularly etc.) and these days much more casually (pottering around levelling and doing bits & pieces). We brought lifetime subs to LOTRO so have nothing to pay there and tend to stick to free-to-play MMOs now. However beyond MMOs relaxing is also reading and various crafts: cross-stitch embroidery & card-making mainly. Reading has been one of my main activities since I was 2 1/2 & Mum taught me to read as she apparently got fed up with me correcting her when she made a mistake reading to me (I have a very good memory). As she puts it I haven’t stopped reading since – it is something I still enjoy doing and I always have at least one book on the go – often 2 or 3 – one actual book, one on the Kindle and one on the Kindle app on my iPad. Embroidery is something Mum started me on when I was 10/11 and I nearly always have something on the go. Takes me forever to do one but it is something I tend to do while watching the little bit of TV that I do. 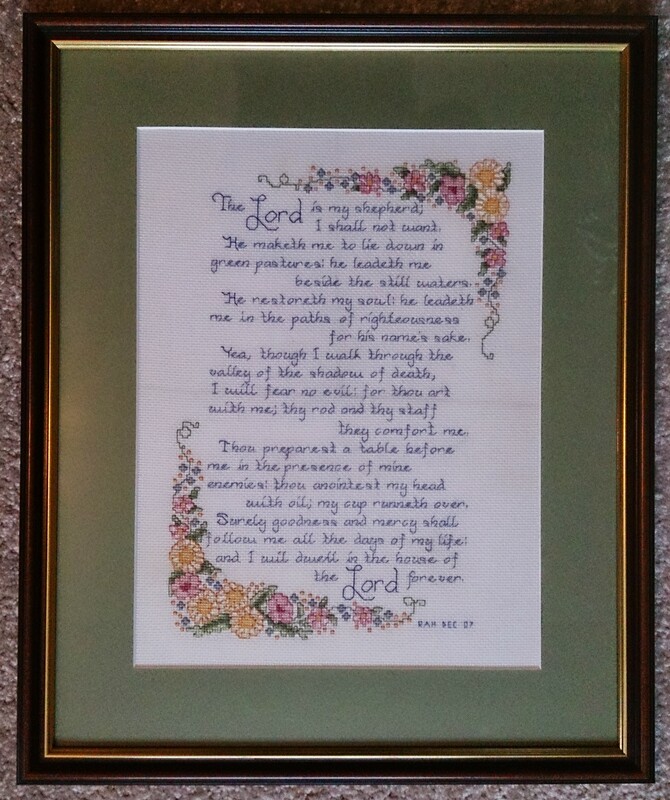 The picture in this post is of an embroidery I finished a few years back (2007) which I gave to Grandma for Christmas that year. it has come back to me after her death earlier this year. Card-making is something I just have periodic blitzes at – made a load of Christmas cards a few weeks back so we had a stock before Christmas crept up on us. This was when we thought our boy would be moving in with us mid to late November. That all changed when we got the phone call last week. Still playing odd bits of MMOs at moment but we are using a lot of our spare time getting jobs finished round the house. The boy’s room is mainly finished – other than something for him to sleep in as we are waiting to hear from FC about that. But we have sorted out the three laundry bags of clothes from my sister (whose elder son is 2 yrs older and younger son is 10 months younger). So there are clothes in the wardrobe, in the chest of drawers and in the cupboard. Plus many more (larger sizes) packed away in vaccie bags on shelf in wardrobe. We’ve installed and got working an IP camera to monitor room and got two of the Ikea Trofast units in and fixed to wall. Expecting to need more but waiting to see – will sort early on in Intros if needed. Plus we want one in dining rom for toys downstairs. Today’s (Sunday 15/9) plan is a quick trip out to local outlet place as I need more casual shoes – I own one pair of walking & my walking boots and that is it other than work shoes. Come back via Costco as we need coffee beans for machine, and then loft sorting time. We brought this house of my parents and there was stuff left in loft then (mainly children’s stuff I will admit). Plus my brother lived with us for about 2 years split over two periods so we have several boxes belonging to him that he can have now he has his own house. This should free up some space for stuff we will need to store. Little worried how much the boy will come with as been told my his SW that his FC is not planning to take any more little ones – just to see out the 2 she has on long-term foster care. So we could end up with loads – hence the need to make sure we have space. My in-laws laughed yesterday when we were discussing this with them. Thankfully after my sister’s experience they seem to be more accepting of what we are saying about things like not picking the boy up initially or giving him anything. Then again my sister-in-law is a yr 2 (was reception) teacher in a deprived area of Liverpool so has experience with the social services & foster care system. She also seems to be getting herself clued up on adoption which helps us no end. Ok this post has veered somewhat around and taken me nearly 2 days to complete (now Sunday morning) but that is my life at moment. 13 more working days to go before it all starts…..